Choosing the best underwater digital camera can be difficult, even with an underwater camera guide. 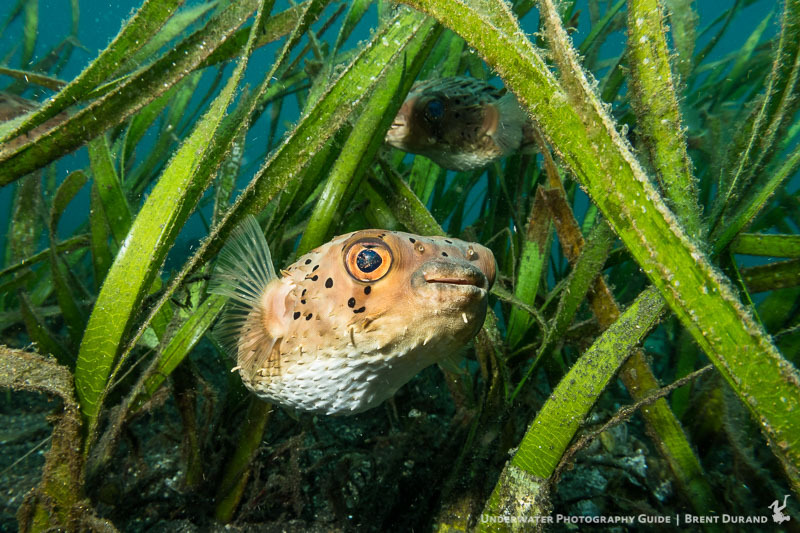 The digital revolution opened up a brave new world for underwater photographers. Underwater digital cameras allow us to immediately see the results of our photos, and share them with our friends when we get home. Very few users of film have tried an underwater digital camera and not switched. If you are looking to purchase a new underwater camera, we recommend also checking out Bluewater Photo's Best Underwater Cameras Guide. Which type of underwater digital camera should you buy? There are compact cameras, mirrorless, and dSLRs. Read more about mirrorless cameras. After shooting with a compact underwater camera, many people consider switching to a mirrorless or a dSLR. The obvious advantages are lens choices with superior optics and different focal lengths, better image quality from a larger sensor and reduced shutter lag and focus delays. These are huge advantages, and shooting with a dSLR is quite a joy. Very few people regret changing. However, a compact camera in the right hands can sometimes take shots that rival a dSLR shot, and the dSLR advantages of shutter lag and focus delay can be less important with non-moving subjects. The largest difference between a compact camera and a dSLR or mirrorless camera is that a dSLR or mirrorless can take different lenses, while a compact camera has one attached lens. This is a very big difference that limits the flexibility of a compact camera, although wet lenses can help bridge this distance to some extent. The Olympus OM-E-M5 II underwater bundle deal is the best deal out there currently for an underwater camera set, $1,299 instead of $2,499 - get one while you can! Noisy at high ISO's, although high ISO has limited use underwater, so this is not a big factor. Less control over depth of field. A larger-sensor dSLR will have a smaller depth of field at a large aperture, giving a blurred background that is difficult to accomplish with a compact camera. 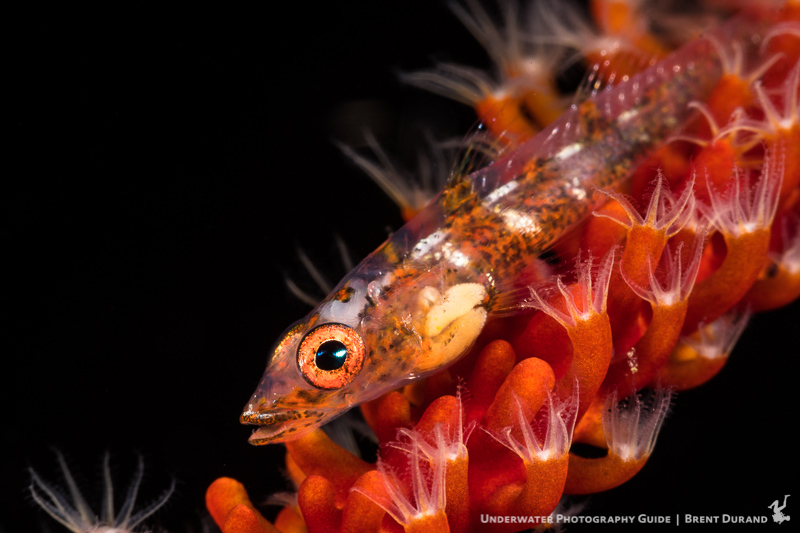 For more information on how compacts differ from dSLR's underwater, and how to use your compact camera underwater, read about using compact cameras underwater. Ability to take a fisheye lens. This can be important for people who want to shoot wide angle, because really great WA photos means getting really close, and the best way to do that is with the UWL-04 fisheye lens. Not many cameras, however, support full manual mode and accept a fisheye wet lens. Raw mode. This is only important if you plan on shooting in RAW, it's nice to have this, but not everyone will shoot in raw. And if you don't have the right settings and the right lens, then having RAW won't matter anyways. Ability to fire strobes via sync cord. This is helpful because some otherwise you must use the camera's pop-up flash, which can be slow to recycle and use up battery time. However, sync cords can be a pain, so if you can find a fiber-optic solution that has decent battery life, and a decent recycle time on the internal flash, this is the way to go . Good auto focus capability. Some cameras are very slow to focus in less than ideal conditions, which is what we often experience underwater. All compacts come up short in this category usually. Is full manual mode important in a compact camera? 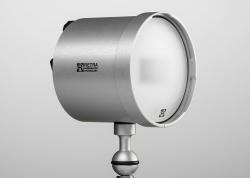 Anyone considering purchasing an external strobe at some point, should get a camera with full manual controls, imho. Most of the time, but especially when using an external strobe, it is very helpful to have complete control over how much ambient light comes into the camera. Although exposure compensation can be used to accomplish this to a limited degree, setting the shutter speed and aperture yourself is the best way to control the ambient light. What are the best point and shoot cameras for underwater photography? A few of my top underwater camera recommendations are the Sony RX 100 V, Sony RX-100 II, Canon G7X II, and Olympus TG-5. Read our Sony RX100 II review, Sony RX100 V review, Olympus TG-5 review, Canon G7X II review, and the Canon G16 underwater shooting guide. For older models, the Canon S95, Olympus XZ-1, Canon S95 are also good choices. The Canon S100, Canon S110 or S120 are also excellent choices, similar to the S95 - although I like the Canon S95 because it doesn't vignette with a fisheye lens. FYI, the Canon G-series and Sony RX-100 series have both taken some of the best compact camera photos that I've ever seen. The new Canon G16 performs great for macro, but the Sony RX-100 and new Sony RX-100 II set a new standard for compact cameras for wide-angle with their large sensors and amazing wet lens results. (Not the Sony RX-100 III or RX-100 IV, find out why in our Sony RX-100 III review). Our sister company Bluewater Photo lists the best compact underwater cameras for 2017. If you need to look at older used setups, the Canon A570, Canon G9/G10/G11 and Olympus SP350 are all good choices - but recent models will perform much better. If budget is a serious consideration, the Sealife DC1400 offers a good housing for the beginner underwater photographer, and to add a strobe is inexpensive. All compacts involve tradeoffs. If you just want to take snapshots underwater, well then there are dozens of cameras that will all produce similar results. Most of the Fuji, Canon or Olympus cameras will be excellent choices. The cameras I list below are the best ones I feel for underwater photography, especially if you ever want to grow past taking a few snapshots. Here is a look at some choices, and their limitations. Here's some quick notes on some camera models, listed in alphabetical order. If the camera you are looking at is not on this list or the chart below, it is probably because I think there is a better option listed. This is especially true of the dozen's of Canon models. Be sure to read our Canon G7 X Mark II Review. Canon A570 - Great choice overall, at a great price point. The strobe can't be fired by sync cable; raw allowed by software update only; decent battery life. Takes a fisheye lens, and macro lenses. The Canon A570 will do raw, with a software download called the “raw hack”. This software update has been used my many people successfully, does not cause problems, and adds many other useful features. See this site for more details. Image quality is excellent. The camera will work well with INON fisheye and macro lenses. full manual model is available. Canon SD990 / IXUS 980 - I just found out about this camera in early 2009. It was released at the end of 2008. It's an ultra-compact, full manual controls, 14.7meg, and it takes an INON fisheye lens with the canon housing. Top-side reviews are great. There is no raw support or raw hack at this moment. Lens is 36-133mm. This camera might turn out to be a top underwater choice, but I have some more investigation to do. I've heard setting the aperture / shutter speed can be a little difficult. The image quality looks excellent based on the underwater images I've seen. My friend is producing some great wide-angle photos with the fisheye lens. $310 in the USA. Canon S90 & S95 - Released in Aug 2009 & Sep 2010, these are great cameras for topside and underwater use. They are small, and have RAW, full manual controls, and a fast F2.0 lens. All housings will take add-on lenses. I tried this camera out topside recently, it was easy to use, photos looked great and I loved the large LCD. Has great potential. Housings are out from Canon, Ikelite, and Recsea. Read my writeup on the camera and the different Canon S90 underwater housings. The Canon S95 adds HD video to the Canon S90. The S95 is smaller than the Canon G12, has the same sensor, and has more wet lens options for wide-angle. But the G12 beats it in some areas. Canon S100 - Very similar specs to the excellent Canon S95, has a slightly longer zoom range, which means you may have slightly better macro capability with a wet lens, and slightly more vignetting with wide-angle wet lenses. The Canon S110 is similar to the S100, but it adds wi-fi and takes away GPS. Canon G9 - Excellent macro and supermacro shots have been produced from the G9. Read my Canon G9 underwater housing reviews. Canon G10 – shoots at 28mm; Canon, Ikelite, Patima and Fisheye (FIX) all make housings for the G10, some of which may support a WA lens. The fisheye housing is $999, at the high-end for a compact camera. Same TTL limitations as the Canon G9. The G10 is generally considered the best topside compact camera out there, but it has limitations underwater, depending on the housing. Read my Canon G10 underwater housing reviews. Canon G11 / G12 - released in Aug 2009 & Jan 2011, and similar to Canon G10. 10 megapixel sensor means larger pixel size than the G10, which is probably a good thing. Housings are out from Canon, Ikelite, Fisheye, and Recsea. The Canon G12 is very similar, and adds HD video and a control dial. The macro on the Canon G11 & G12 is superb. The G12 is a top of the line compact camera, and does everything a little bit better than all the other compacts, including the S95. Canon G1X - released in March 2012. You can read the Canon G1X review, which talks about the less than ideal macro capability of the lens on this camera. Canon G15 - Slightly fast focusing than the Canon G12, read our Canon G15 mini-review. The Canon G16 just came out, and is similar to the Canon G15. Canon SX1 IS - RAW, full manual, HD video but 28-560mm zoom range means wide-angle wet lenses won't work well. Fuji F200EXR - looks like a nice camera, no raw, but full manual controls (although only 2 aperture settings), and a good-quality fuji housing is available. A great point and shoot choice. Camera+ housing available for $440 (July 2009). Nikon P6000 – shoots raw, manual controls, TTL with Ikelite housing.. not rated as good as a Canon or the LX3 though. The consensus is get a Canon g9 or g10 instead. Oly 5050/5060 - very old camera, but excellent optics and capabilities; some pros believe this was the best compact camera for UW photography ever made. I have to warn you though, it has a long focus/shutter delay compared to recent compacts; no fisheye capability, but takes a WA lens. The oly 5050 has a much better lens. The best photos I've ever seen from compacts are from an Oly 5050. The prints look spectacular. Olympus 1030 SW, 1030SW - no manual controls, no manual white balance, no raw. Internal flash can't be used in super macro mode. good points are that it's waterproof to 33ft. Not a great choice. Could be good for snorkeling, kayaking, etc. without a housing. Olympus FE-360 - no manual controls or white balance, poor topside reviews, skip it! Olympus XZ-1 & XZ-2 - read our complete Olympux XZ-1 review. The camera is great, will RAW, full manual controls, HD video with auto-focus, and an excellent lens. The XZ-2 is similar to the XZ-1. Panasonic Lumix DMC-LX3 & LX5 – shoots Raw; widest compact at 24mm, has full manual controls. Considered a top-quality compact. $399 new. The housings are by 10bar or UK-Germany. Strobes can fire via sync cord or fiber optics. I've seen great wide-angle photos with the INON UWL-100 wet lens and the INON dome port (giving you a 130 degree field of view), in the 10-bar housing. Also with the INON macro lenses. This camera has great potential, and Edvin Eng is producing some great photography with this setup. See my Panasonic Lumix LX3 10bar underwater housing review. Sea &Sea DX-1G – I don't think the earlier or less expensive S&S compacts were very good, but many people now like the DX-1G. the DX-1G uses a Ricoh GX100 inside; low focus/shutter lag, raw mode, very close macro focus, full manual; wider than most compacts at 24mm; competitor to the Canon G9/G10; cons - fiber optic only, and it only takes S&S wet lenses. there is no fisheye option. Sea &Sea DX-2G - came out in April 2009. Similar to the DX-1G, uses a Ricoh GX200 inside. It is believed that the GX200 will not work inside the DX-1G housing. The time in between shots when shooting RAW has been improved great, and it has a larger LCD screen. Read our Sea & Sea DX-2G review. Sealife – often sold by dive shops, always sold as a camera/housing combination. Here is a good review comparing the canon g10, Nikon p6000, and Panasonic lumix lx3. It’s a topside review, but still useful I believe. Prices are approximate only looking on ebay, google stores, or pricegrabber. Prices are for a reference point only. Prices may be for a refurbished camera for an older model. Prices from “questionable” sellers were not included. (1) Very subjective answers based on speaking with people. Make sure you use highly rated 2700mAH rechargable double-A batteries like MAHA. (2) YES means it takes just a regular WA lens; Fisheye means it will also take a fisheye lens; maximum field of view is shown if known. You may need a wide-angle lens and a dome port to get maximum angle of coverage. (3) Adding a WA lens to the canon G12/G15/G16 can be a little difficult, because of the way the camera and housings are made. Check with your housing manufacturer to see what is supported at this time. For $275, you can get an Ikelite or Fantasea dome port that gives you only 28mm of WA coverage. Recsea also offers a seperate WA port and fisheye lens with port for a 130 degree view for more money. Choosing a mirrorless camera can be tough - there are many excellent models out there, with only small differences between them. Our top choices are the Olympus E-M1 Mark II and the Panasonic GH5, with the Olympus OM-D E-M5 II being a very close second choice. The Olympus OM-D EM-1, OM-D E-M10 III, and Panasonic GX8 are good choices for underwater photography. They are a great choice in-between a compact and a dSLR. You can read more in our micro-four thirds and mirrorless camera guide. The Olympus E-PL5, E-PL7 and E-PM1 are fairly recent models, and have improved auto-focus speed over the E-PL1 and E-PL2. The Olympus OM-D E-M1 and E-M5 both came out not too long ago, and are considered two of the best micro-four thirds camera on the market. The Olympus E-PL5 has the same sensor and image processor as the OM-D E-M5, and is an excellent value. The new Olympus OM-D E-M1 II is a little bigger than the E-M5 II, and a little more expensive. Image quality is similar to the E-M5 II, but build quality is better and auto-focus is a little faster. The Sony A6500, A6300, A5100 are excellent mirrorless cameras, with great image quality, and unsurpassed video capability. The sensor size is the same as a Nikon D300 or Nikon D7100, and they have their own lens mount called Sony e-mount. Image quality, dynamic range and focus speed is excellent. The only downside is a less limited lens selection than micro-four thirds cameras, and slightly slower focusing speed than a dSLR. But the cameras and housings are much smaller than a dSLR. The fisheye and macro lens options are good quality and very inexpensive, although a longer macro lens choice is lacking. Read our Sony a6300 Mirrorless Camera Review. 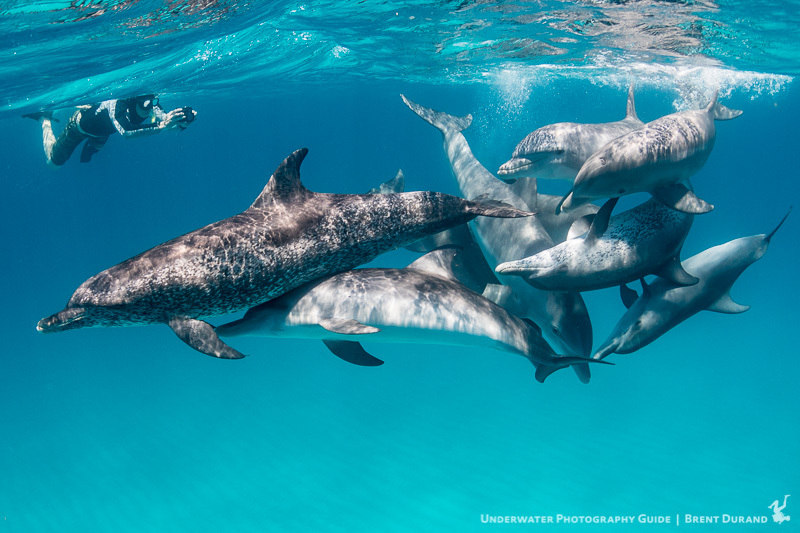 Click here for a Complete Overview of Mirrorless cameras for Underwater Photography. The new Sony A7 II is a new small, full-frame mirrorless camera that can take exceptional images. Although lens selection used to be limited, you can read about new Sony A7 full-frame lenses that are came out in 2015, that have definitely changed the landscape for this option. The A7 II series improved on the less than stellar auto-focus of the A7 cameras, making the A7 II and A7r II two of the top choices for underwater photographers. A full-frame sensor, plenty of megapixels, a full range of lens choices, a small size and professional video capability make the A7 II cameras an increasingly popular choice - but don't expect the battery life or responsiveness to be at the level of a high-end dSLR. There are a large number of dSLR camera bodies out there. The main 2 brands used in UW photography are Nikon & Canon. Whichever brand you choose, make sure you are happy with the lens selection that brand supports. Sony and Fuji also make great dSLRs, but those are not yet covered here. A good lens, proper composition, and proper lighting are important for making great photos. The camera body is less important, and excellent shots can be made with Canon or Nikon bodies. Your photography is unlikely to improve dramatically just by switching camera bodies. If you choose Canon or Nikon, you will also have to choose between cropped sensor or full frame sensor cameras. Cropped sensor dSLR's are the most popular dSLR's underwater. So who shoots full frame? Generally people who already own a full-frame camera (for indoor sports, weddings, and landscape photography), and want to house it, or pros that have specific shots in mind with a wide-angle lens, often of sharks, dolphins or other pelagics. Professionals who have a requirement to print larger than 20x30 at 300DPI also must sometimes shoot full frame to get the required resolution. - For most people, cropped sensors are "good enough"
Used cameras are fine; just make sure you check the shutter count. Mechanical shutters will eventually fail. The shutter count is also referred to as the number of actuations. If you're buying used, and your camera uses a mechanical shutter (e.g. - D90,D7100) - check the number of actuations (shutter clicks) by getting a jpeg file from the camera and using an exif viewer. You can't check on the camera, so you'll need to bring your laptop and a card reader if you're meeting someone to buy a used camera. Look for "shutter count" or " camera actuations"
Camera bodies can be further researched here. I personally wouldn't get too hung up about small differences in sensor quality reviews. Nikon D5000 - annouced on April 14th, 12megapixel, hi-def video, same sensor as the D90. It lacks an auto-focus motor. Too bad is doesn't autofocus with 3 of my 4 favorite lenses, just like the D60 and D40. Retail is $730. I'd pass on it, and get a D80/D90 unless you are ok not using a fisheye lens underwater. The nikon 10.5mm and tokina 10-17mm fisheyes won't auto-focus with this camera. I tried out a Nikon d60 once and did not like it at all. If price is an issue go with a used D80/D200 instead. Nikon D40 or Nikon D60 - No autofocus motor - please see comments on the Nikon D5000 above. very good image quality though. btw, The nikon d40, d40x and d60 can all work in the same housing. Nikon D300 – Excellent camera and photos. But it’s hard to tell the difference between D80/D200 photos and D300 photos taken underwater. I upgrades to this from the D80 so my wildlife photography could benefit from 1 stop higher ISO. Nikon D300s - same as D300 + video. Great housing from Sea & Sea. Nikon D7000 - great choice, brand new with HD video that can auto-focus. Hybrid body between a D90 and D300s. Our top choice for a dSLR camera for underwater use. Nikon D7100 - the new Nikon D7100 is quite amazing - read our Nikon D7100 review. Housings came out in Spring / Summer of 2013. Nikon D90 – excellent choice. Sensor rating is even better than the D300. And it does video! Many people are able to use their D90 in a D80 housing, with some slight housing modifications. 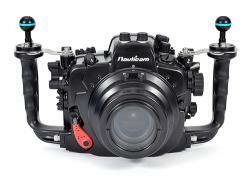 Nexus and Aquatica housings are popular, and here's a Nauticam D90 underwater housing review. Nikon D80 – Great camera, great photos. Practically the same sensor as the D200, so you’ll get the same image quality. Get a used housing at a discount. Nikon D200 – Great camera, great photos. Get a used housing at a discount. Canon 40d/50d/60d – the Canon 50d fits into the canon 40d housings. A nice surprise for canon 40d owners! Both are excellent choices, especially the Canon 50D. Instead of the Canon 60D, I'd go with a Canon 7d. Canon T2i, T3i, T4i, T5i - excellent entry-level dSLRs. Some of the aluminum housings are great values for these cameras. The T3i is very similar to the T2i, see the T3i release coverage for differences. The T4i and T5i both made improvements in the video capability, and the T4i and T5i both fit into the same housings. Olympus E520 – great value; good lens choices at a decent price; housing is a good value too. The new Nikon D800 is my top choice for the ultimate pro underwater photographer camera. The NIkon D4 is also great, but a little overkill for underwater photography. Nikon D3, Nikon D4 – Excellent camera, but Keep in mind people have been having problems getting the 14-24mm lens sharp behind a dome port. And there is no full-frame equivalent of the Tokina 10-17mm lens. Canon 5d – wide-angle photos really pop on this camera. Great for topside landscape photos also. Canon 5d Mark II – the specs on this camera look great, and the photos look excellent. I'd pair this camera with the excellent Canon 8-15mm fisheye lens. Canon 5d Mark III - a new standard for Canon full frame cameras, with much improved auto-focus over the 5D Mark II. Canon 5D Mark IV - The latest camera in this long line. Into wide-angle? Canon 5d Mark IV & Canon 5Ds R take some excellent wide-angle shots (but so do the rest). Really interested in live view underwater, or great image quality in a smaller package? Look into the Sony A7 IIr, Sony A5100 or A6500, or the Olympus OM-D E-M1 II or E-M5 II. The Panasonic GH5 / GX8 and Sony A7 II cameras take the best video. Looking for the most compact setup with a larger sensor? Look at a mirrorless camera setup. What's the hottest bodies out there right now for underwater use? Look at the Nikon D500 or a Canon 5D Mark IV, or a Nikon D850, Sony A7r II, Sony A6500 or the Olympus OM-D E-M1 II. The faster the sync speed, the easier it will be to light up subjects with your strobe with the sun in the background. With a slower sync speed, you need a small aperture to properly expose the sun, and therefore even stronger strobes. The Nikon D90, D5000, D7000, D7100, D7200, D800, D810, D4, Canon 7D, 70D, 7D Mark II, Canon T2i, Canon T3i, T4i, T5i, and the Canon 5dII & 5dIII can shoot hi-def video, although auto-focus can be slow, and there are other limitations. Although this feature is not ready to replace dedicated video cameras, this is great for capturing behavior and marine life videos that you couldn’t normally have taken, and works very well when shooting ultra-wide angle. However, the auto-focus on the Canon 70D & 7D Mark II during video is quite good. The Nikon D7100 & D7200 can take HD video, and also auto-focus while taking video - but the autofocus does not work that well. For the best video underwater you may want to look at a mirrorless camera like the Panasonic GH4, GX8 or the Sony A6000 or A7 II. The Sony NEX cameras can autofocus during video much better than dSLRs can, and the video quality is excellent. Same with the Panasonic GH3 & GH4. Most people who want to do serious underwater video will get a Panasonic GH3/GH4, Sony NEX-7/A6000, or a Canon 5D Mark III / Canon 70D. Visit our Underwater Video Section for detailed info, tips and tricks. Submitted by g.boudron (not verified) on Sun, 2013-01-06 17:19. I have a G12 and Inon D 2000 strobe;good-even very good ones can be made with this set,but...it has its limitations,among others,for good macro/supermacro (Unfortunately I discoverd Lembeh and am just totally bewitched by criTters)Hence,the temptation to upgrade is very strong;what could i buy for a reasonable budget for that purpose?I can figure out a Canon SLR with a macrolenses+housing and decent strobes.I am happy to pay the right price-but not at a medium sized car tag! Can anyone help a (in hte future poorer) diver? Submitted by eliassaj on Mon, 2012-03-12 01:43. I am very new into underwater photography and I own a DLSR already . The problem I have it eh Housing , BS kineticks that costs arrount 1900 Euro for a normal Port . Pictures above water of the Sony A550 are Excellent , I am not sure how my camera will do underwater . If it wont give great pics , maybe I should switch to any of the above mentioned, Cannon or Nikon before buying the CAse for the A550 . Submitted by RJ Abney (not verified) on Sun, 2012-01-22 03:00. I've always wanted under water top digital cameras and I don't know how to choice what the best under water digital cameras I'm going to buy. Submitted by Fishfingers (not verified) on Tue, 2011-10-11 21:17. The Panasonic Lumix DMC-FT2 is a fairly new model, any reviews on it? Submitted by Roger (not verified) on Mon, 2011-07-25 15:07. Used a Canon S60 for several years, as a professional diver, brilliant piece of kit, leave it on auto, then use photoshop 9 to auto correct,top notch results, even had pics in paper from it!! Now use Canon EOS550, equally good. and love my new A2 Epson printer, what a toy, beets buying wallpaper!!! Submitted by Sony W300 (not verified) on Wed, 2010-09-08 21:49. Submitted by Paddy (not verified) on Sun, 2010-05-23 01:51. What do you think of the Olympus EPL-1 in an PT-EP01 casing? I need to shoot super-macro (need to get photos of the polyps of soft corals). Do you think the system is ok to do this? Submitted by Anonymous (not verified) on Thu, 2010-03-11 21:21.
i faund same lenses from Fanta line for the WP-DC 28/35. but i dont now if they are work god thogether. Submitted by Nathan Ciurzynski (not verified) on Wed, 2010-02-03 08:44. Thanks for all the great information here! Submitted by Ron Myers (not verified) on Tue, 2010-02-02 17:00. Submitted by cj (not verified) on Fri, 2010-01-01 11:17. Submitted by Graham McMahon (not verified) on Sun, 2010-02-21 01:29. I'm an enthusiastic, albeit not very good photographer. Above sea level I use a Panasonic Lumix FZ28 and wanted something similar underwater. However, after using an Intova LC800 on a Digital Underwater Photography course I bought one! So far I am very happy with the images it (I) can take, and it was much better value than other models. I think that the usefulness of a particular camera really comes down to the skill of the photographer. The most expensive camera you can get won't necessarily take better pictures unless you understand the basics of composition. Submitted by Juan Diaz (not verified) on Sun, 2009-12-27 09:30. What do you think about the Sony - Cyber-shot DSC-W290? Submitted by Ad (not verified) on Tue, 2009-10-27 17:37. Curious to hear thoughts on the Canon S90 for underwater photography. Haven't figured out yet whether there is housing available that allows you to use the rings. Submitted by Cathy Church (not verified) on Tue, 2010-12-14 09:12. The problem with the S90 and all of the compact Canon cameras is that it will not support TTL when you use the manual controls. This is not a fatal limitation, but for many who want to shoot on full manual (especially for macro), the loss of TTL reduces the odds of getting that great exposure for every photo. Submitted by scottg on Wed, 2010-12-15 00:17. Good point Kathy, although in low light you can get away with TTL in aperture priority mode for macro. Alternatives like the DX-2G have TTL in full manual and better macro capability out of the box. Submitted by Marcelo Mariozi (not verified) on Mon, 2009-08-31 00:39. I think there is a BIG difference between D300 and D80/D200 just look at any wide angle picture with the sun in it. Submitted by scottg on Tue, 2009-09-22 16:24.
thanks for your input Marcelo. I really don't see a difference, but everyone is entitled to their own opinion. the d300 does have a slightly larger dynamic range, which could show up as small difference in a photo with the sun in it, but I think camera settings and conditions make a larger difference. Submitted by Anonymous (not verified) on Sat, 2009-08-22 09:48.
with regard to the tokina fisheye in manual mode. Do you have guidance on the depth of field of the fisheye. if I were to use it in manual focus mode, and "effectively" pre-focus it at close up , or infinity before I went under water -- what would be the depth of field. I have the D5000, and buying lenses. I love it for land use, but haven't bought a housing yet. ( still waiting). But I'm beginning to wonder if I should have bought the D90 for the AF underwater on more lenses. Submitted by scottg on Tue, 2009-09-22 16:21.
regarding the D5000 vs d90, yes, a nikon dslr camera with an AF-S motor is much more useful for underwater photography, in my opinion. Submitted by dreddolfo on Sat, 2010-03-20 09:22.
had a bit of a shock learning from your review about the limited possibilities with fisheye lenses. My question is what about using the Nikkor 10-24mm AF -S Dx instead ????? Submitted by William A Libecap (not verified) on Sat, 2009-06-27 19:31. The Olympus SP-350 can have excellent battery life as long as you use this Lithium Ion battery. Submitted by Anonymous on Tue, 2009-04-07 12:52. What do you mean when you say the internal flash doesn't work with the Canon G10 and Ikelight housing? Submitted by scottg on Tue, 2009-04-07 13:38. Submitted by drendo324 on Thu, 2009-04-09 11:23. Is that only when you use the additional dome? Submitted by scottg on Thu, 2009-04-09 15:39.